The W.K. Kellogg Foundation has added 26 more organizations to its Rural Policy Networks, a multi-year initiative designed to improve the lives of those living in small communities across the nation. Each organization receives a $100,000 grant (over five years) to participate. The Rural People, Rural Policy initiative began three years ago with an at-large network and four regional networks, in Central Appalachia, the Great Plains, the Mid-South, and the Southwest. A Network of National Organizations was added, and this year Kellogg funded an existing Michigan Network. The networks bring together diverse organizations for developing rural policies locally, statewide, regionally and nationally. For details, including lists of network members, click here. "The Bush administration is preparing to ease the way for the nation's largest private landowner to convert hundreds of thousands of acres of mountain forestland to residential subdivisions" by granting greater rights to cross national-forest property and turn logging roads into residential avenues, Karl Vick reports for The Washington Post. "Local officials were stunned and outraged . . . The deal was struck behind closed doors between Mark E. Rey, the former timber lobbyist who oversees the U.S. Forest Service, and Plum Creek Timber Co., a former logging company turned real estate investment trust that is building homes." Jennifer McKee of The Missoulian reported last week, "At issue are decades-old agreements Plum Creek has with the Forest Service that allow the timber company to drive across federal land to log its own property." McKee's story reported that Democratic U.S. Sen. Jon Tester had asked the service's parent agency, the Agriculture Department, to block the deal until the two years of Rey's private negotiations with Plum Creek can be investigated. Rey has said he expects to conclude the deal in August. "Forest Service lawyers leveraged promises from Plum Creek to moderate the impact, including mandating 'fire-wise' measures to reduce the danger from summer wildfires," Vick writes. "Under the new agreement, logging roads running into areas controlled by Plum Creek could be paved -- and would thrum with the traffic of eight to 12 vehicle trips per day to and from each home," according to Missoula County official Pat O'Herren. The county "is threatening to sue the Forest Service for forgoing environmental assessments and other procedures that would have given the public a voice in the matter," Vick reports. "County officials say their objection is not to change, which traditionally rural jurisdictions have struggled to manage, but to being blindsided by Rey's announcement of a far-reaching change negotiated in secret. Plum Creek owns 57 percent of Missoula County's private land, a posture that under state law gives it veto power over any zoning." It owns 1.2 million acres in western Montana and 8 million nationwide. The deal "threatens to dramatically accelerate trends already transforming the region," Vick writes. "Plum Creek's shift from logging to real estate reflects a broader shift in the Western economy, from one long grounded in the industrial-scale extraction of natural resources to one based on accommodating the new residents who have made the region the fastest-growing in the nation. Environmentalists, to their surprise, found that timber and mining were easier on the countryside." Most of the new homes "are the second, third or even fourth homes of wealthy newcomers who have transformed the local economy -- 40 percent of income in Missoula County is now 'unearned,' from, say, dividends -- and typically visit only in the summer." Vick interviewed one, a hedge-fund partner who expressed dismay that the valley where he built has "almost become kind of a housing subdivision." The U.S. Department of Education this week allowed six states to write their own plans for complying with the No Child Left Behind Act, a law that has proven troublesome for many rural school districts. The states are Florida, Georgia, Indiana, Illinois, Maryland and Ohio. They "have come up with plans to more closely tailor solutions to individual schools' problems and focus resources on schools in the worst shape," The Associated Press reported. The states that sought flexibility and didn't get it were Alaska, Arkansas, Louisiana, New Jersey, New York, North Dakota, Oklahoma, Pennsylvania, South Carolina, Tennessee and Virginia. Education Secretary Margaret Spellings "has said up to 10 states will be allowed to try to participate in the pilot program," AP's Nancy Zuckerbrod reported. "The Education Department plans to review additional state proposals this fall." Approved states will no longer have to "take certain steps at specific times for missing math and reading testing goals. Critics have complained that the approach is too rigid and treats schools the same regardless of whether they miss the mark by a little or a lot," Zuckerbrod noted. "Examples of changes the states plan to make include requiring schools to offer tutoring earlier than is currently called for and a greater reliance, in Indiana for example, on testing throughout the year to catch academic weak spots." Two supervisors at the meatpacking plant targeted in the country's largest immigration raid were arrested Thursday on charges that they helped illegal immigrans use false Social Security numbers and resident alien cards, and a third supervisor appears to be on the lam. The man being sought, Hosam Amara,"according to former plant workers, was the master-mind behind a car sales scheme that encouraged undocumented workers to purchase used cars and fraudulently register them," Lynda Waddington reports for the Iowa Independent. Arrested were Martin De La Rosa-Loera, 43, who "was in charge of the poultry facility and three other departments at Agriprocessors" in Postville, and Juan Carlos Guerrero-Espinoza, who "supervised beef kill as well as three other departments at the plant," Waddington writes. The latter is a U.S. citizen; the foirmer's immigration status is unknown. The indictment charges that a few days before the May 12 raid, "Guerrero-Espinoza told a group of employees that they needed new identification and Social Security numbers in order to continue working at the plant," Waddington reports. "He then, according to testimony, told the workers that they would need to provide him with a photograph and $200 or $220. Fraudulent resident alien cards were allegedly supplied to Agriprocessors workers." The share of rural American homes with high-speed Internet service, or broadband, grew 23 percent in the past year, according to the latest update from the Pew Internet and American Life Project. Overall, broadband adoption grew 17 percent, so rural areas continued to catch up with the rest of the country, but still lag well behind, and the catch-up rate slowed. The latest survey found that 38 percent of rural households have broadband, up from 31 percent a year ago. But the rate in cities is 57 percent and in suburbs 60 percent. Nationally, 55 percent of households have broadband and 10 percent have dial-up Internet service. The rural share of broadband use is 64 percent of the combined rate for cities and suburbs. Last year, it was 62 percent. In 2005 and 2006, it was 56 percent, so the catch-up rate lagged in the past year. 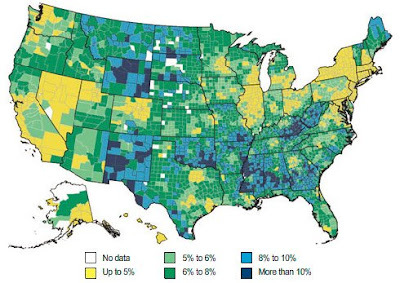 Broadband remains unavailable to many rural Americans. Among dial-up users, 24 percent in rural areas say broadband is not available; that is much higher than the national figure of 14 percent. Overall, 28 percent of rural adults said that broadband is not available where they live. In other localities, the rate is 22 percent. In some areas, relatively expensive satellite broadband service is all that is available. The survey found that 16 percent of rural broadband users get it via satellite, comparied to 10 percent in cities and suburbs. Despite the expansion of broadband in rural areas, the "digital divide" seems to be increasing. Broadband adoption among African American and low-income households (defined as less than $20,000) slacked or stalled in the past year, even as more better-off households upgraded their service. Among those with broadband, about a third pay more for even higher speeds. For a PDF of the full report, click here. While online learning may seem like a simple solution to the lack of AP in rural schools, it is not so easy. First, not all students can learn virtually. Virtual learning requires discipline. If students haven’t been challenged prior to jumping into AP, unless there’s an instructor to assist them along the way, the personal responsibility is overwhelming, considering you have to pace yourself and study on your own. Secondly, one of the greatest obstacles is the lack of broadband Internet connections in many rural areas. Virtual learning includes tutorials, graphics, and documents that take a long time to load without computer broadband. Luckily, my high school had high-speed access, but I was not this fortunate at home. I had to battle with a crawling Internet connection to do large amounts of homework (by senior year, I had “high speed” at home). Linn, from Clear Fork, W. Va., is now a student at Duke University. For her story about Advanced Placement, click here. When I was a kid in the 1960s, my father was a car dealer, and his prize in a sales contest was a trip to Las Vegas. He took a tour of the Basin and Range country and heard about the Bureau of Land Management adoption program for wild horses and burros, which keeps their populations to manageable levels. So my brother and I got a burro, and we named him Rawhide, for the TV show that brought Clint Eastwood to stardom. Now more kids will need to get some burros, or the BLM may have to start killing them to keep their numbers in check. BLM auctions of horses and burros are attracting fewer buyers, because of recent increases in hay and energy prices and the closure of all U.S. horse slaughterhouses, which has led to a surplus, Marty Durlin reports for High Country News. For her video report, click here. The progam is not limited to the West. For example, the Mid-Atlantic Wild Horse & Burro Show will be held Aug. 2-3, at the Delaware State Fairground in Harrington. For a list of shows, click here. For an article from Feedstuffs FoodLink on a recent meeting in Washington on the horse crisis, click here. For a PDF of proceedings of the meeting, sponsored by the American Horse Council, click here. UPDATE, July 20: In The New York Times, Felicity Barringer's situation piece includes this graf: "Some environmentalists and scientists have come to see the mustangs, which run wild from Montana to California, as top-of-the-food-chain bullies, invaders whose hooves and teeth disturb the habitats of endangered tortoises and desert birds." Brothers and sisters, we can't tap dance around the fact that there are a lot of folks out there just like that woman. A lot of them are good union people; they just can't get past this idea that there's something wrong with voting for a black man. Well, those of us who know better can't afford to look the other way. I'm not one for quoting dead philosophers, but back in the 1700s, Edmund Burke said: 'All that is necessary for evil to triumph is for good people to do nothing.' Well, there's no evil that's inflicted more pain and more suffering than racism -- and it's something we in the labor movement have a special responsibility to challenge. It's our special responsibility because we know, better than anyone else, how racism is used to divide working people. We've seen how companies set worker against worker -- how they throw whites a few extra crumbs off the table -- and how we all end up losing. But we've seen something else, too. We've seen that when we cross that color line and stand together no one can keep us down. California Gov. Arnold Schwarzenegger signed legislation today to restore the state open-meetings law's ban on serial meetings, a common device that members of public boards nationwide use to avoid scrutiny. The law, which takes effect Jan. 1, overturns "a bad appellate court decision that gave members of local bodies the green light to freely discuss the public's business with each other outside a noticed, open and public meeting so long as no agreement was reached," reports the California Newspaper Publishers Association Bulletin. Schwarzenegger vetoed a similar bill last year, asking for one "that more judiciously addresses the problem of serial meetings that result in public policy decisions." CNPA convened a summit of local-government stakeholders in its offices, leading to "compromise legislation that achieved the neutrality of almost all local agencies and their representative organizations," CNPA reports. The law reads: "A majority of the members of a legislative body shall not, outside a meeting authorized by this chapter, use a series of communications of any kind, directly or through intermediaries, to discuss, deliberate, or take action on any item of business that is within the subject matter jurisdiction of the legislative body." It also amends the state open-records law to clarify that a local agency cannot discriminate among its members in allowing access to public records. How does your state's law read? Is it strong enough? The U.S. harvest was staggering toward disaster several weeks ago, but flickers of hope surfaced on Monday., David Streitfeld report for The New York Times. Recent floods were likely to damage the corn and soybean harvests less than expected, and farmers planted more corn than previously expected, which should boost output, the Department of Agriculture said. "This will allow a little breathing room, assuming we don't have inclement weather during the rest of the growing season. said Daniel W. Basse, president of AgResource, a Chicago consulting firm. "Corn prices, which have repeatedly hit new highs, fell sharply Monday to $7.25 a bushel after the report from the Agriculture Department," Streitfeld writes. "Wheat, which had been moving up in the general enthusiasm for commodities, also tumbled. Soybean prices fluctuated but moved above $16 a bushel to a new high on supply worries." According to Basse, an unprecedented move by the USDA to open up millions of acres of conservation-reserve land for 2009 crops has lessened. The government expects a loss of 3.5 million acres of corn and soybean acres from the Midwest rains of May and floods of June, down from previous estimates of 5 million acres. A major factor in the shift is last-minute replanting efforts by farmers. "The Agriculture Department said farmers planted 87.3 million acres of corn, up from 86 million they said they intended to plant in March and second only to last year's acres, the highest since World War II," Streitfeld writes. "Corn prices were so high that farmers put marginal land into production and shaved acreage devoted to other crops." Click here to read Streitfeld's article. View the USDA's "Weekly Weather and Crop Bulletin" for July 1 here. Rural and other community newspapers with strong local-news franchises have been insulated from Internet competition, but all newspapers are being hit by big increases in the cost of newsprint -- which, incidentally, tends to be produced in rural areas. "The price of paper stock, a daily publisher's second-biggest expense after labor, has climbed 26 percent to a 12-year high of $700 a metric ton since October, pushed upwards by supplier consolidation rather than demand," Sarah Rabil reports for Bloomberg News. Abitibi- Consolidated Inc. and Bowater Inc. merged in October, creating AbitibiBowater Inc., the world's largest manufacturer of newsprint, with 45 percent of the North American market. News Corp. has decided not to sell Ottaway Newspapers, the community-paper chain that it acquired as part of its purchase of Dow Jones & Co. last year. Most observers had expected Ottaway to be sold, partly because the newspapers in the chain are smaller and more rural than those News Corp. chairman Rupert Murdoch operates in the U.S. or his native Australia. News Corp. had said it would explore a sale of Ottaway. "Since then, valuations for newspaper companies have fallen amid an accelerating decline in advertising revenues due to weakness in the economy and a continued migration of ad dollars online," The Associated Press noted. The company declined to comment on the decision, but several Ottaway papers published stories about it yesterday. "In May, Ottaway announced that it was cutting jobs," Editor & Publisher reports. "At the time, CEO John Wilcox said that the cuts accounted for less than 5% of the company's total workforce." Ottaway publishes eight dailies and 15 weeklies. The dailies are the 80,000-circulation Times Herald-Record of Middletown, N.Y., and The Record of Stockton, Calif., 59,000, both with substantial rural readerships; The Standard-Times of New Bedford, Mass, 32,000; the Mail Tribune of Medford, Ore., 31,000, one paper that ran a story about the decision; the Pocono Record of Stroudsburg, Pa., 19,500; the Portsmouth (N.H.) Herald, 12,300; The Ashland (Ore.) Daily Tidings, 5,010; and The Danville (Pa.) News, 2,623. Click here for a list of all Ottaway papers. USA Today has picked up where The New York Times left off almost four weeks ago, reminding the nation that high fuel prices hit rural people hardest -- especially those in the poorest rural areas like Appalachia, the Black Belt, the Mississippi Delta and Indian country. Like the Times, USA Today cites research from the Oil Price Information Service and Wright Express, which collects credit-card data, showing that rural residents "spend as much as 16.02% of their monthly family income on gas, while people in urban areas of New York and New Jersey spend as little as 2.05%." The USA Today map below, using data from the companies, shows percentages by county. The data make localizing this story easy. Here's an example from the Lexington Herald-Leader. While this story isn't new, it deserves continued attention. Winslow Mail: Killed by a cynical reporter? "A lot of people just stopped subscribing because he kept writing the same things over and over. Always bad news," Michele Hernandez told Wagner. "The paper was out of touch with the community. There was a lot of negativity." Biancini wrote "nearly everything" from "a cynical perspective," LeeAnn Arganbright, publisher of the Pioneer, which opened in Winslow soon after the Mail died but has accumulated only 300 subscribers. "The town went to Western Newspapers and complained and cried that they needed another writer. But they wouldn't let him go until all the ads were pulled and there was no hope." Editors at Western, which bought the Mail in 1998, did not return calls, Wagner reported. "Biancini, now a landscaper, concedes he focused more on muckraking than covering the small-town social scene." Biancini told him, "They just want to know who died and where the next garage sale is. They essentially shut the paper down." Lack of business in the town of 9,500 was a contributing factor, but the closing is counter to a national trend. "I get more calls about people starting up small-town weeklies than I do closings," Brian Steffens, executive director at the National Newspaper Association, told Wagner. But in small towns, "Pressures are greater," Steffens said. "The need to be diplomatic and fair is greater." Wagner writes, "In that sense, the Mail's fate is an object lesson for publishers who must balance journalism ideals with economic realities. Steffens says that even an established newspaper can fail if it alienates customers. The result is an information vacuum: Advertisers no longer have a trusted forum where they can sell products or services; citizens lose a sentinel for the public interest." 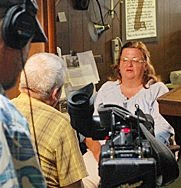 Linda Trest, a reporter at the Gasconade County Republican in Missouri, has made national news with her uncovering of the record of a man named Bill Jakob, who came to the town of Gerald and convinced local officials that he was a federal agent on a mission against methamphetamine. CBS News producer Charlie Brooks, center, interviewed her for a report on "The Early Show," scheduled to air tomorrow morning. Trest was going beyond the county line with her reporting. Gerald is in Franklin County, but only 11 miles from Owensville, the Gasconade County seat and home of the Republican. The Republican posted a Web page about the national coverage. For Trest's initial story, click here. Wal-Mart Stores Inc., known for its hard bargaining with national suppliers, said today that it is the largest buyer of locally grown fruits and vegetables, which it defines as anything grown in the state where the selling store is located. The world's largest retailer "said it will purchase and sell $400 million worth of produce grown by local farmers within its state stores this year, an effort the company says will only grow," The Associated Press reports. "Academic studies show buying local cuts down on transportation mileage, while also assuring customers of a product's providence amid mass recalls." Since Wal-Mart "leverages bulk purchases to keep prices down, buying from local farms might not appear to fit the company's strategy," Jon Gambrell writes. But it "has focused on buying fruits and vegetables from farms nearest to their distribution centers, making shipping easier while cutting down on trucking in produce from outside of the area, said spokeswoman Deisha Galberth." Making his second small-city appearance in as many days, presumptive Democratic presidential nominee Barack Obama told a crowd in Zanesville, Ohio, population 25,000, today that he would upgrade President Bush's office of faith-based initiatives from what he called "a photo op." Ohio is a battleground for Obama and presumptive Republican nominee John McCain, especially in places like Zanesville and largely rural Muskingum County, pop. 85,000. In the Ohio primary, Hillary Clinton won the county, 67 percent to 31 percent. Yesterday, in Independence, Mo., Obama tried to deal with questions about his patriotism, fed by Internet rumors that are often false. "Polls have shown that a small but statistically significant slice of the electorate continues to question Obama's patriotism, especially in white, working-class regions," The Washington Post noted. The speech got good reviews, but was overshadowed by controversy over retired Gen. Wesley Clark's remark that McCain's military service did not qualify him to be president. Obama took "a stroll down one of this tiny town's quiet streets Monday after a speech on the topic of patriotism," Jennifer Loven of The Associated Press reported. "That sort of public appearance isn't something the Democratic presidential candidate does often, and he encountered people welcoming him onto the porches of their bungalows and clamoring politely but energetically in small crowds to see him." Tiny town? Independence, a suburb of Kansas City, has a population of 120,000. That howler aside, Loven relates a funny vignette. A memorial service was held yesterday for a journeyman journalist who worked many places in his career, usually for newspaper groups, but always seemed to find himself at home and in touch with his readers. Ron Filkins, publisher of The Kentucky Standard in Bardstown, Ky., died last week at 57. "Ron brought his personality to Bardstown on Day One," and quickly became comfortable in the town of 11,000, his friend Bruce Reynolds said at the memorial service at My Old Kentucky Home State Park. "Ron was a leader," Reynolds said. "Not just at the newspaper where he happened to be working, and not just in the community where he happened to be living, and not just in the civic clubs like Rotary where he was member for over 30 years. . . . I don’t think Ron had his name on any brass plaque anywhere around here when he left us. My name happens to be on a plaque in a couple of places. But I would gladly drill them all off right this minute if I thought that I had any chance whatsoever of achieving what Ron Filkins achieved with his engravings. … The name Ron Filkins is engraved indelibly on dozens of hearts and minds stretching from Iowa to Nebraska to Texas to Arkansas to Indiana to Kentucky." After college in Arkansas and Iowa, Filkins settled in Texas. He first became an editor at The Perryton Herald, then "moved to newspaper management, serving Southern Newspapers and the Walls family of newspapers for 10 years," Standard News Editor Stephanie Hornback wrote. He joined Landmark in 1996 as publisher of the Perry County News in Tell City, Ind., and came to the Standard in 2002. He was also regional manager for three Landmark weeklies: the Leader-Union in Vandalia, Ill.; the Red Oak Express in Red Oak, Iowa; the Opinion-Tribune in Glenwood, Iowa; and The Spencer Magnet in Taylorsville, Ky. (Read more) For a tribute from a reader, click here. UPDATE, July 9: The Filkins family has designated Kentucky Child Now, the state affiliate and lead agency for Colin Powell’s America’s Promise, as a recipient of memorial gifts. Click here for the memorial information page, here for the memorial gift page. A new law giving Mississippians access to police incident reports took effect today, following a strong campaign by the state's newspapers, but some law enforcement agencies are not providing the reports on a timely basis, Dan Davis, managing editor of the Hattiesburg American, writes in a note to the state's newspapers, distributed by the Mississippi Press Association. "Some law enforcement agencies . . . said we must submit a written request daily and then they have up to 14 days to respond," the limit under the law, Davis reports. "We met with most of our local agencies last week to discuss the new law. The general feedback at that meeting was that they want to be cooperative with us. But that's not happening." Davis asks for reports from other newspapers for a story the American is planning for later this week. "Every community had its own story to tell. . . . All of us together have done something we couldn't do alone," a driving force behind the series, Sun Herald Executive Editor Stan Tiner said during a panel discussion on the law during last week's MPA convention in his town of Biloxi. Tiner said "for a long time" local officials took advantage of Mississippi media's nature "as Southerners" to be understanding of government officials. "We had been losing ground over the last few years," he said, "and that was no longer acceptable." Tiner said the series "spoke directly to the people," who then told elected officials they didn't like the secrecy. Neshoba Democrat Publisher Jim Prince, chairman of MPA's lobbying committee, said it was evident in a crucial meeting with police chiefs and sheriffs that the stories had an impact. Prince, Tiner and others said much remains to be done. "Mississippi still has some of thw weakest open-government laws," said David Hampton of The Clarion-Ledger in Jackson, who moderated the panel. Tiner said, "We have taken sort of some baby steps," adding that newspapers need to write editorials explaining "how you as a citizen will gain from this information," and keep working with local officials for cooperation. The Republican National Committee and the National Rifle Association will be going after Barack Obama's record on guns, both said last week in the wake of the Supreme Court's ruling that the Constitution grants an individual right to own firearms, making a ban on handguns in the District of Columbia unconstitutional. Jonathan Martin of Politico writes, "While the gun culture is typically associated with the South, it’s actually the industrial Midwest where hunting is most popular. Pennsylvania has the most NRA members per capita of any state, and, after Texas, the next four states that sell the most hunting-related goods are Pennsylvania, Wisconsin, Michigan and Missouri, according to the Association of Fish and Wildlife Agencies. And while Bill Clinton, Gore and Kerry could all handle a gun and had been hunting many times over the years, Obama has never hunted in his life and is the furthest thing from an outdoorsman." Martin reports that the NRA "plans to spend about $40 million on this year’s campaign, with $15 million of that devoted to portraying Barack Obama as a threat to the Second Amendment rights upheld last week by the Supreme Court." NRA chief lobbyist Chris W. Cox told Kuhn the effort will point to Obama's comments that small-town voters "cling to guns" because they are "bitter" over economic decline. "There are a lot of bitter gun owners who are looking to vote against Obama," Cox said. Obama's campaign told the Chicago Tribune last year, "Obama believes the D.C. handgun law is constitutional," and he didn't dispute that proposition in a February interview with Leon Harris of Washington's WJLA-TV. Last week, an Obama spokesman said the statement "was not worded as well as it could have been" and that Obama believes the Constitution generally "doesn't prevent local and state governments from enacting their own gun laws." West Virginia's second wind-energy generating station has gone into service "quietly," reports The Charleston Gazette, which had difficulty finding out much about it. "NedPower Mount Storm LLC's turbines are generating electricity along the Allegheny Front in Grant County," Ken Ward Jr. writes. "Developers of the 264-megawatt project confirmed the project's status in response to reports from local residents that turbines appeared to be operating." A spokesman for Dominion Resources Inc., which gets the electricity and is a partner with Shell WindEnergy in the project, grudgingly said that some turbines have been generating since the first of the year. Howeverm Ward found that "PJM Interconnection, which manages the regional electrical grid, lists the NedPower project as 'in service' as of the third quarter of 2007. In late February, Dominion told its shareholders that the 164-megawatt first phase of NedPower was to be fully operational by June 2008. The second phase was expected to be fully operational by December 2008." Immigration raids, many of which take place in rural areas, often at meatpacking plants, seize hundreds of undocumented workers but usually allow their employers to remain free and keep working, Stewart Powell writes for the Houston Chronicle. "Once again the federal government has it backwards," said Texas Rep. Ted Poe. "It is a waste of time if we don't go after the business owners who are knowingly hiring illegals. If we eliminate the illegal job opportunities, we can start to eliminate the problem." Federal immigration agents have arrested more than 2,900 suspected undocumented workers on administrative immigration charges and 775 more workers on criminal charges over the past eight months. During the same time period, only 75 bosses, including business owners, supervisors or human resources workers, have been arrested on charges such as harboring or knowingly harboring undocumented immigrants. This accounts for barely 2 percent of the 3,750 total workplace immigration arrests since October. "The presence of illegal aliens at a business does not necessarily mean the employer is responsible," Immigration and Customs Enforcement said it a statement. "Developing sufficient evidence against employers requires complex, white-collar investigations that can take years to fruit." "Undocumented workers often face quick prosecution for so-called ''status crimes" such as being in the country illegally — charges that are easy to prove. Many of those arrested quickly plead guilty and serve sentences averaging as little as a month," Powell writes. "But to convict employers, federal prosecutors must show that they knowingly hired undocumented immigrants, a threshold that demands more evidence." Read more here. Penner details ways store owners sidestep minimum purchase requirements, including multiple stores ordering together and grocers who own multiple stores serving as distributors. "Many of the small grocers say that their biggest downfall is competition with super stores. We can call it natural to shop where you think prices are lower (not always true), but we have to make it natural to support the local store," Penner writes. The Rural Grocery Store Summit, organized by Kansas State University's Center for Engagement and Community Development, allowed grocery store owners, city representatives, distributors and rural advocacy agencies to come together on June 1 to discuss similar challenges they face. Two primary issues were distribution and customer loyalty. "Citizens of a small town find it very inconvenient if they don't have a store," Penner writes. "Many will run to the local store for milk and bread yet buy the majority of their groceries at a super center. That trend must reverse for small town grocery stores to survive." Penner also reminds store owners that "to succeed, a small store must be clean, efficient, and community minded." Kansas State's CECD adopted the rural grocery store issue as a project. Click here to learn more. For decades West Virginia was a reliably Democratic state, its mother Virginia just as reliably Republican. In the current presidential race, each lean the other way, illustrating some critical shifts in the nation's political geography, Alec MacGillis writes for The Washington Post. "It would be hard to find a pair better positioned to clarify the split, and show which segment holds sway in 2008 than (Sen. Barack) Obama and Sen. John McCain," MacGillis writes. "Obama, 46, offers himself as someone who can transcend the red-blue divides of the past decade. But the biracial senator from Illinois epitomizes the new Democratic coalition, with his years living abroad and in big cities, his intellectualism and his urbane flair, and his campaign's lofty rhetoric and Internet savvy. McCain, 71, lacks Bush's ties with evangelical Christians, yet the Republican from Arizona still embodies a more traditional America, with his wartime heroism, his mantra of service over individualism and his admittedly limited technological literacy." But at the root of the shifts are changes in economics and lifestyle. "As the distance between the rich and the poor grows, so too does the gap between regions," MacGillis reports. "In places such as West Virginia, manufacturing and mining have been decimated by automation and foreign competition, and hopes for reinvention are undermined by the stream of young people leaving." In Northern Virignia's dynamic, "technology-driven economy ... Democrats are strengthening their hold," while Republicans "consolidating their hold in rural areas and small cities, while making inroads in struggling Appalachian and Rust Belt regions that were a core of the Democratic base," MacGillis writes. "Democratic areas are sopping up people with B.A. degrees; Republican areas are sopping up white people without degrees," said Bill Bishop, author of The Big Sort: Why the Clustering of Like-Minded America is Tearing Us Apart. "There are all these things telling people they should be around people like themselves. And every four years, this has political consequences." Click here to read a review of Bishop's book by Al Cross, director of the Institute for Rural Journalism and Community Issues, in The Courier-Journal. Bishop is a member of the Institute's advisory board. West Virginia voted for George W. Bush in 2000, in large measure because of fears that Al Gore was adverse to coal and guns. It went even more strongly for Bush in 2004 and presents a challenge for Obama this year. Rep. Shelley Moore Capito, the only Republican in the state's congressional delegation, said Democrats "do appeal more to an upper-middle-class, higher educated, faster-moving kind of voter. Voters here are still waking up in the morning saying, 'I want to make sure my kids get fed and that someone's not trading away my constitutional rights." To read MacGillis' entire article, click here. The University of Alabama at Birmingham has received a five year, $2.6 million grant from the National Cancer Institute "to determine the effectiveness of interventions aimed at improving quality of life for women recovering from breast cancer in rural areas," according to a news release from the university. The study, which will include surveys and interviews, is designed to prevent survivors from falling through the cracks in rural areas "because these women are particularly vulnerable to being lost in translation." Karen Meneses, Ph.D., a U.A.B. School of Nursing professor, will direct the study. "We found in previous interventional studies that for women who live in a rural area it takes at least an hour or hour and a half to travel to a regional cancer center," she said. "They also may have very few support groups because they have few cancer societies or cancer centers to support them in their immediate area. It is important for us to know how to help these women because no matter how much we extend peoples lives through our medical breakthroughs, we must work daily to help them maintain one's quality of live, which meas women being able to enjoy their lives beyond diagnosis and how they change lives in different ways and learn from that." Click here to read the entire news release, which includes details of the study's design and a video of Meneses discussing the project. Does your state allow payday lenders to charge annual rates of 456 percent? Alabama does, and in Calhoun County, they outnumber banks, 31 to 30. "Opponents have another name for them: predatory lenders. Their prey tends to be the working poor, the military, seniors, those on fixed incomes, without access to conventional credit," The Anniston Star said in the first installment of an editorial-page series on the issue, which began last Sunday and concluded today. The 25,000-circulation daily revived the Biblical term usury, which the Oxford English Dictionary defines as "the practice of charging, taking, or contracting to receive excessive or illegal rates of interest for money on loan." The paper said, "Its essential wrongness is noted in history and ingrained in our Judeo-Christian values. See it referred to in unflattering terms in the books of Isaiah, Exodus, Ezekiel, Psalms and others. With this kind of moral clarity, it is perplexing that a biblically based society such as Alabama's would put up with such widespread sin in our midst." In density of payday lenders by population, Alabama ranks second only to Mississippi, but the problem is national. "In 2006, approximately 19 million Americans used payday lenders, borrowing almost $48 billion from some 24,000 outlets nationwide," the Star said. Twelve states have limited annual interest rates to 36 percent, effectively outlawing the industry because the same interest rate generally applies to traditional small-loan companies. Several other states have limits between 36 and 456 percent. "In states where predatory lending is strongly regulated, the Center for Responsible Lending found that residents saved an estimated $1.4 billion in fees every year," the paper reported. For state-by-state information, click here. In its final editorial, the Star offered some state and local solutions for the problem. It also published a supportive commentary from Alabama Arise, a leading critic of payday loans, and a rejoinder from Borrow Smart Alabama, which said it is "a group of more than 225 Alabama payday and title-lending stores that have joined together to encourage the wise use of short-term loans and to help the public better understand our services." The state has 1,164 payday lending outlets.